How do I change which audio jacks are used for input and output? How can I do the same under Linux? If possible, please don't suggest something that involves PulseAudio or JACK; I'd like to do it the plain way, e.g. by editing ALSA configuration files, if possible. The way I understand it, my problem should have nothing to do with software servers redirecting streams, just instructing the driver to treat this jack as so and so because it's hardware supported. Now this will make the GUI start, but its usage is not explained, and it's not exactly newbie-friendly. So to make life easier I'll explain how I did it. In my case, it was a matter of two clicks; the tricky part was locating exactly what needs to be clicked. The list contains many nodes called Node[0x##] followed by any of AUD_OUT, AUD_IN, AUD_MIX, PIN and VENDOR. The only ones you have to look in are the PIN ones. Inside the Config Default field, some nodes will have in the first line Jack Connection: N/A; we need the ones that say Jack Connection: Jack as in the screenshot. Then, in the three checkboxes in the Widget Control group below, uncheck IN and check OUT. Using the same way, you can assign any of the front or rear jacks to either input or output. Now if you close the window, it will ask whether you want to revert changes. Saying yes reverts them immediately; saying no keeps them but only for this session. If you want to keep your changes permanently, don't close HDA Analyzer yet. Instead, click "Exp" (Export) at the bottom-left and use Save As to write the python script to a file. Now copy that file to something like /etc/hda-mods.py and edit /etc/rc.local as root (e.g. using gksudo gedit /etc/rc.local) and add the line python /etc/hda-mods.py right before the exit 0 line, then save it and reboot. Your changes should survive. 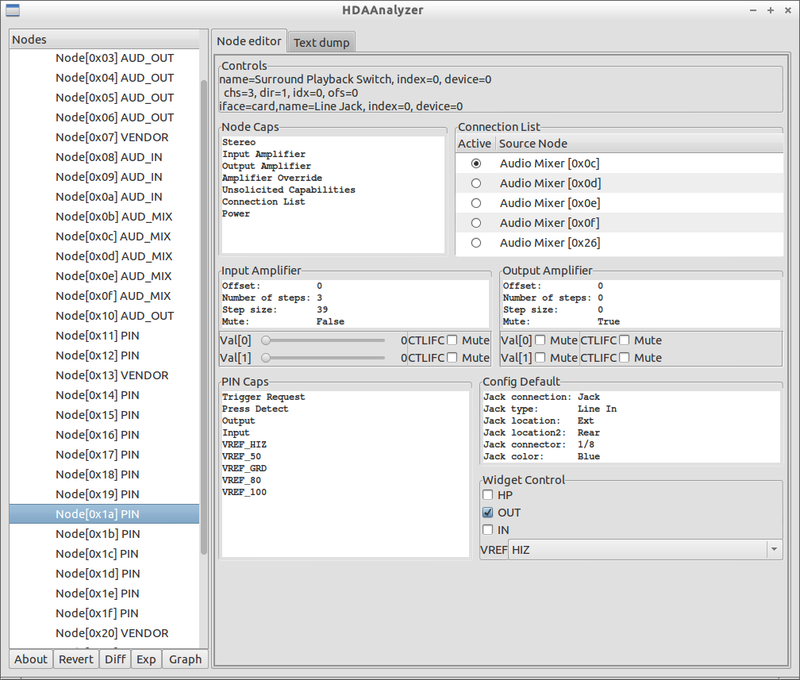 Another gui tool might be hdajackretask from the alsa-tools-gui package. Very simple gui, supports boot override and advanced options. Not the answer you're looking for? Browse other questions tagged pulseaudio alsa or ask your own question. 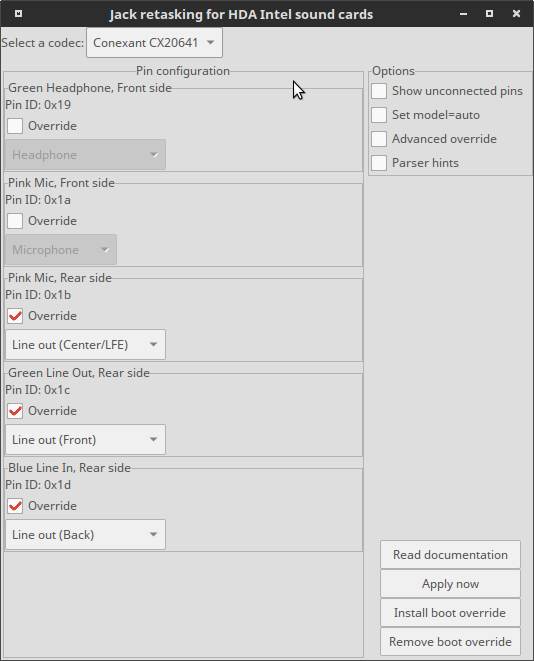 How can I use line in jack for second pair of speakers? How do I map the audio motherboard jack to some other jack?